Tags: Adam Lehrhaupt, Indie Choice Awards, Indie Choice Nominees, Maggie Stiefvater, Mr. Tiget Goes Wild, Peter Brown, The Dream Thieves, Warning: Do Not Open this Book! The America Booksellers Association announced the finalists for their Indie Choice Awards. Winners will be announced April 17. See the list below for the picture book, middle grade and young adult nominees. The Dream Thieves, by Maggie Stiefvater (Scholastic). I loved this one. Very realistic teen male voices. 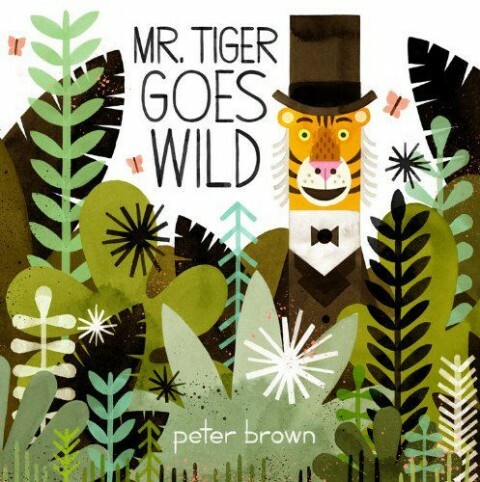 **Mr. Tiger Goes Wild, by Peter Brown (Little, Brown Children’s) Absolutely loved the message of this book. 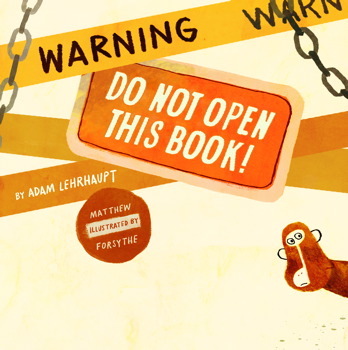 **Warning: Do Not Open This Book!, by Adam Lehrhaupt, Matthew Forsythe (Illus.) (Paula Wiseman Books) It isn’t easy to pull off speaking directly to the reader but Adam Lehrhaupt does just that. How many have you already read? As you can see, I’ve only read three of them (marked with **) but reviewed them all on The Bookshelf. Looks like I have some more reading to do. I only listed the juvenile books. You can get the whole list here on the ABA site. Idea Generation: Where Do You Get Your Ideas? 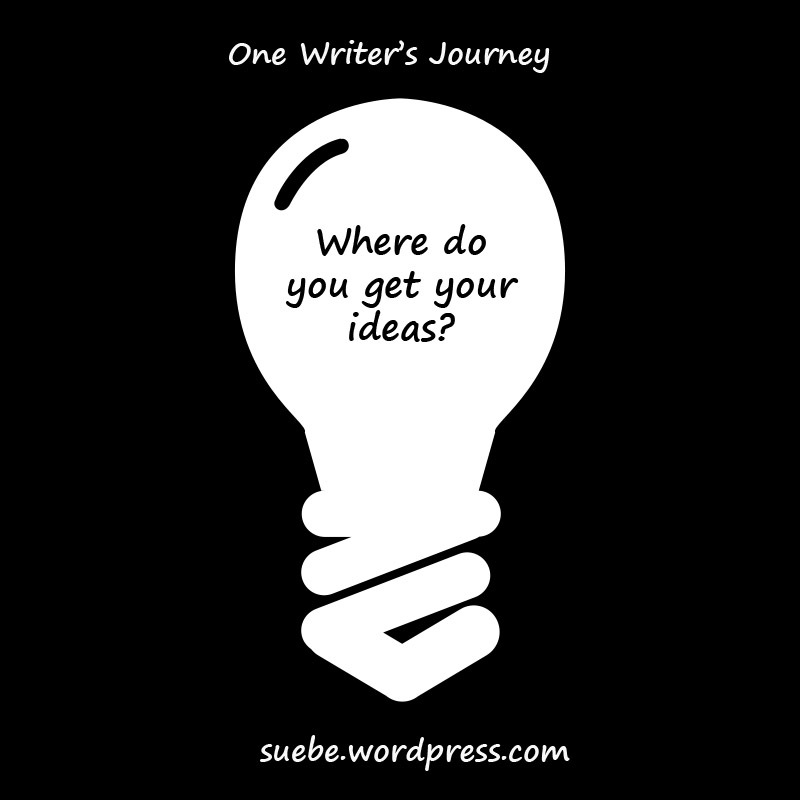 Are you a writer who struggles for each new idea? I have to admit — that is so not my problem. In part, I think this is because I write nonfiction. But it also because I’ve taught myself to harvest. Wherever I am, I filtering what I see and hear for ideas. When we visited several Lincoln sites, one referenced a particular woman as his first love. Interestingly enough, at another site the day before, we had read about what bunk the whole theory was. Why the controversy? Could that be an article? At Meramec Cavern, I found a display on cave formation. Then I cornered a ranger who didn’t move quickly enough. She gamely answered my ridiculously picky questions and gave me the name of the rangers whose expertise includes the history of this particular cave system. Parent/teacher meetings generate ideas for educational activities. A trip to the zoo becomes research for a Noah’s ark story. Whatever I read, whereever I go, I’m collecting ideas. The biggest problem is that it is habit forming. I thought it was just me until I got a message from my friend Stephanie Bearce. She’s writing like a maniac to meet the deadlines for her first series. The more she researches, the more she writes, the more ideas she has for additional nonfiction projects and fiction projects alike. How do you come up with ideas for your work? Changes are once again afoot at Bloomsbury Children’s Books. But that’s become the “thing” in modern publishing. Bloomsbury bought out Walker Books for Young Readers along with the rest of Walker and Company in 2005. When it was acquired, Walker published about 40 books a year and several Walker employees were moved to Bloomsbury. Then it was remodeled as a “boutique imprint” with Emily Easton bringing in most of the 18 books. The Walker imprint is now being folded into Bloomsbury, and Emily Easton will be leaving the company. Bloomsbury Children’s Books plans to produce 100 to 125 books in 2014. 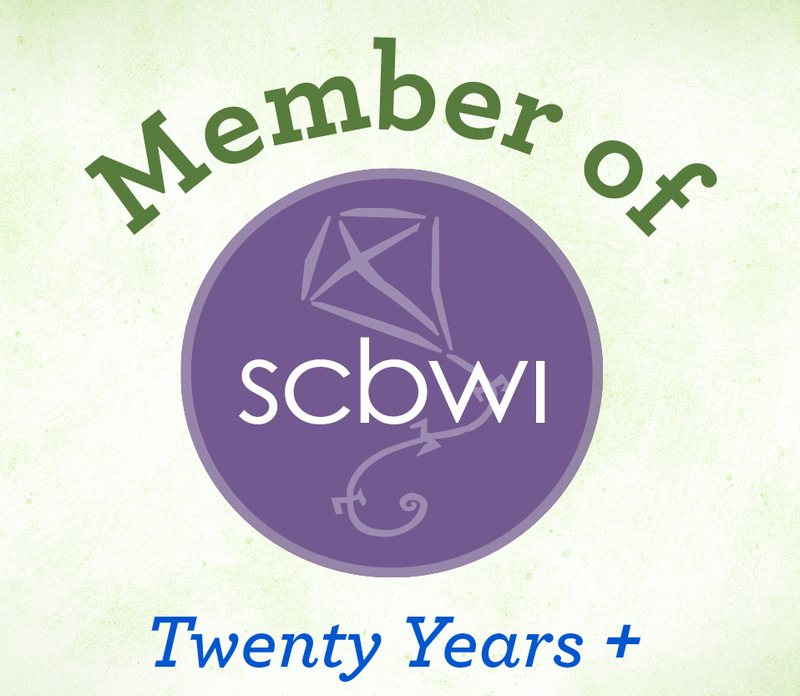 Bloomsbury is closed to submissions but if you registered for the Missouri SCBWI Advanced Writer’s Retreat, you will have a chance to meet and learn from Bloomsbury senior editor, Mary Kate Castellani. Recently, Margo Dill posted about how stressed she was because her book was launching, thus the launch party was this week, her daughter was sick and their house had finally sold. “How,” she asked, “do you deal with the stress?” Everyone gamely offered up suggestions. In horror, I read “Get your husband to take you out for dinner…” No! Don’t go out. You’re already stressed. Sorry. That’s just the introvert in my raging at being drug out with people when I’m already maxed out. 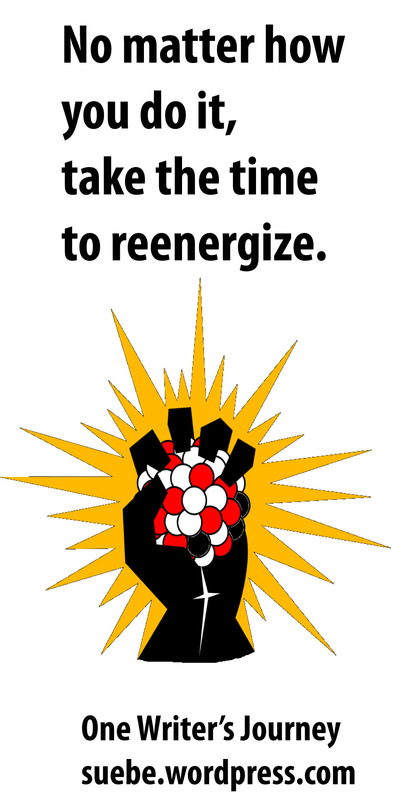 The first step to reenergizing? Figuring out if you’re an extrovert (I actually live with one) or an introvert (me, me, pick me!). Warning, you can genuinely like people sometimes and still be an introvert. An extrovert can be quiet. To decide which you are, look at where you get your energy. As much as I like being around people, I am truly an introvert. When I’ve had enough . . . let’s just say that enough is enough. My methods to recharge probably only work for introverts. Do something nurturing and quiet. For me, this can mean knitting while I listen to music or an audio book. Or I walk on the treadmill and read a book. But my absolute favorite? Pajama Day is pretty simple. You spend the day in your pajamas. You don’t do things that you have to do. You do things that you want to do. You don’t have to stay unplugged all day, but start the day that way. Do not check your e-mail. Do not go over your manuscript one last time. That query letter? Back away! I generally lay claim to the sofa in the living room. It’s long enough to stretch out on, the cushions can be rearranged for maximum comfort and there’s no TV. It is also a supremely sunny room, bright and cheery. My next pajama day is scheduled for April 5th. If you drop by that morning, I will be in my pajamas. For more on how to deal with the stress of writing and life, see my post today at the Muffin. Most of what I was working on at that were picture books although I had written and sold one rebus. 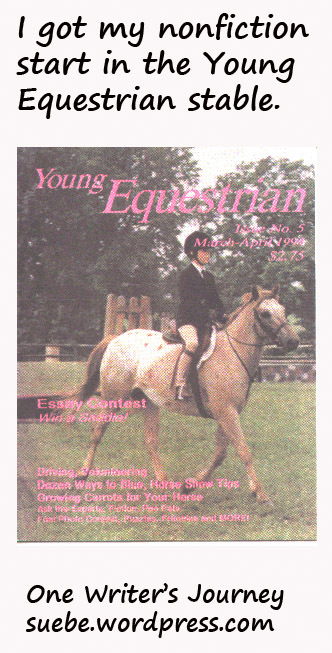 I hadn’t written anything for a tween audience and I certainly hadn’t written nonfiction about horses. Still, I loved Marguerite Henry and pitched a profile to Tammy. She said yes and I got busy. Eventually, I had 18 articles to my credit and I had learned a lot. She taught me about market (kid’s interests vs. adult interests). She taught me to always have one eye on the gate keepers (adults do PG things). She rewrote my leads (and I studied them). And she helped me learn to interview kids (without also interviewing mom). Accepting Tammy’s challenge was probably the smartest move I’ve ever made. I now have over 400 sales and only two of them are fiction. I am most definitely a nonfiction writer. If you are interesting in learning to write nonfiction, my class Writing Nonfiction for Children and Young Adults starts on April 7th. As of March 1st, 2014, Sylvan Dell Publishing has changed their name to Abordale. Publishing since 2004, they will continue to produce fun picture books with themes of science and math. The change was made to avoid an expensive law suit over the use of “Sylvan” in the publisher’s name. The company was named after the farm owned by co-owner Donna German’s grandfather. Sylvan Dell is Latin for wooded valley which is also what Arbordale means. This allows the publisher to use the same logo which will help create continued brand recognition for their customers. If you have web links to sylvandellpublishing.com they will auto redirect to arbordalepublishing.com. Although e-mail addys have changed, messages sent to the old addys will be forwarded. For more information on the name change, click here. Interested in this fantastic educational publisher? Click here for full author’s guidelines. Good news! Albert Whitman has reopened their doors to unsolicited manuscripts. Here are just a few of the details that you can find on the Editorial Guidelines page. Email submissions only. Send to submissions@awhitmanco.com. 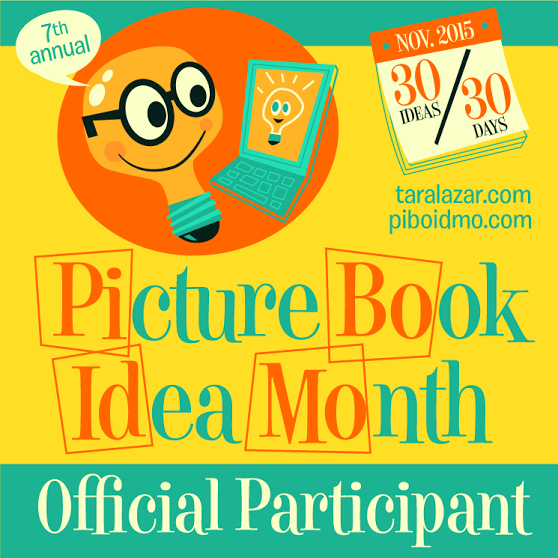 Seeking nonfiction picture books and fiction picture books, middle grade novels and young adult novels. Only responds if interested. Assume no interest if haven’t heard back in 3 months. Include cover letter in body of e-mail. Manuscript should be sent as an attachment. Prefer WORD documents but will take PDF. Size limit of 4MB. Pay special attention to subject line formatting in picture book, middle grade, or YA guidelines. Note: They are seriously specific as to what they want in the cover letter, etc. Sure, it sounds intimidating (what if I mess up?) but think of it as a good thing. You know exactly what to send. What are you going to submit first? 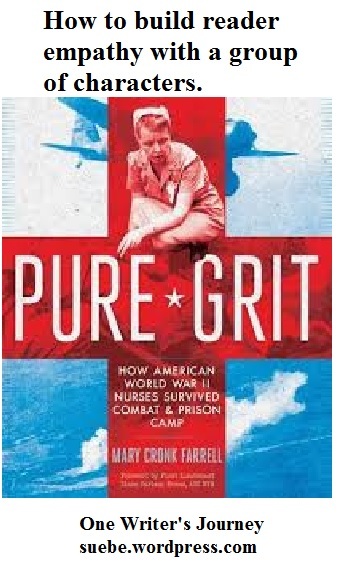 Last week, I read Mary Cronk Farrell’s Pure Grit: How American World War II Nurses Survived Battle and Prison Camp in the Pacific. As I was reading about the variety of women who were sent to the Pacific both as Army and Navy nurses, it struck me. This is a story very like Unbroken, Laura Hillenbrand’s book about Leo Zamperini. Where Laura had to build reader empathy with one man, Mary had to build it with a whole group of women. What was that experience like? Me being me, I contacted Mary to ask. SueBE: You’ve written biographies of single individuals, such as Top of the World. Pure Grit tells the story of a group. What was the same about building reader empathy for a group of characters vs a single character? Mary Cronk Farrell: I knew I had to find the characteristitcs about each woman that was unique. I had to find the core characteristics of each woman. That I could find in my research. Details about what they grew up, what kind fo family they lived in why they joined the nurses corps. When I originally proposed this story, I thought that I would chose one woman for each segment. I would tell teach chapter from a different woman’s point of view. But when I started writing it, I realized that I would have to leave out too much good stuff to do it that way. It was a risk to do it that way but I did. SueBE: What other reasons did you have for choosing to tell a group story vs the story of a single individual? Mary Cronk Farrell: You have to look at what the core of the story is. If the core of the story has to do with the relationship between the characters or their interdependency, then you write about the group. This story could have been told from one woman’s point of view and it still would have been fabulous. SueBE: That feel for the group and them working together really comes through in Pure Grit. What are you working on now? Do you have another group story in the works? Mary Cronk Farrell: I have a biography that is coming out and its about one woman. I’m working on another nonfiction story that is about a group of women. I haven’t submitted it yet. I’m doing it as a group story because its something they did as a group. It has been difficult to find the thread to tell the story. It isn’t a biography but an event that involved the group. I think it may be harder to do as a children’s book. In a picture book you need such a distinct story line with a single narrative arc. Finding that in a group story is hard. SueBE: Whether you are writing a biography or a piece of nonfiction about a group, you have to find the story as well as a way to make the character(s) real to the reader. Read Pure Grit to discover how Mary did this. She will inspire you to find stories previously untold and bring them to life for young readers. Thank you to Mary for taking time out of her busy schedule to discuss writing with me! Just a quick heads up that CBH Ministries has changed their name to Keys for Kids Ministries. CBH stood for Children’s Bible Hour and focused on their radio ministry. Children’s Bible Hour was replaced by Down Gilead Lane in 2001. This meant that the name CBH took a lot of explaining. Keys for Kids Ministries on the other hand makes it obvious. The focus is . . . Keys for Kids. Their work is still Biblically based. And changing media won’t make this new name dated. I didn’t see anything about their actual writing needs changing but will keep my eyes open. Creating rich three-dimensional characters is tough, but one way to do this is by feeding your own interests. Let me explain. Lately, I’ve read a lot of books with characters who want to be writers or whose parents are writers. Then there are the parents who are teachers and librarians. It’s easy to see what happened. The authors are writing what they know — books and writing. After a while, this focus on books and words seems a little surreal because it has been done too often. 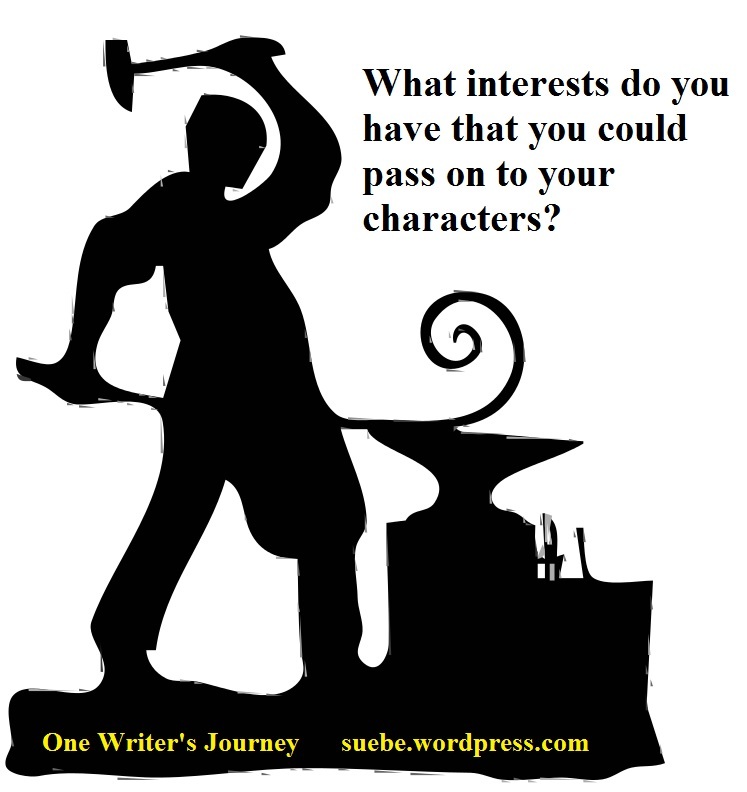 To avoid this, connect the character to your other passions. Let him know all about your favorite hobby. I know writers who are dancers and equestrians, athletes and musicians, fiber artists and bakers. Their stories and their characters come alive when they bring their non-writing careers and hobbies into play. If there is something that intrigues you, take a class. I did this when I took a class on teaching evolutionary biology. In this first class, I realized how dated my knowledge from college had become with so much new work in genetics. So I followed this up with a class on human evolution. But all the while, I felt a little guilty. Yes, I was loving the classes but they weren’t writing related. And then a writing buddy pointed out to me that they could be writing related if I gave these interests to one of my characters. I had to laugh at myself because I’d just finished The Cabinet of Curiosities by Douglas Preston and Lincoln Child. Between the three main characters, they know all about writing and libraries and archives (no surprise), archaology, pre-med studies, paramilitary techniques, opera, historic manuscripts, early natural history (cabinets of curiosities), New York City history, architecture, art and much, much more. Clearly, the writers’ passions had come into play as they developed these characters. Do the same thing with your characters, pulling in your loves and experience. Soon you’ll have a host of characters who are deliciously complex.